The translation tool helps you reach a global audience much better, as your forms can cater to a multilingual audience. It will help your visitors control the language that your form reads in, bringing you higher conversion and satisfaction rates. 1. To get started, click SETTINGS at the top > FORM SETTINGS on the left, then click SHOW MORE OPTIONS. 2. Next, you need to setup the default FORM LANGUAGE. Note that you won't get into the translation options unless you pick a default languages first. The usual workflow is to build your form first, as is, using the default language, then add the other language translations afterwards. 3. Right below the FORM LANGUAGE section, click the EDIT button to begin with translating the fields. 4. On the Translations section, click ADD FORM LANGUAGE. 5. Select the language you want to translate the form to (in the example below, Español was selected), then click the ADD FORM LANGUAGE button. 6. The translation window for the selected language should open up. You can now start adding your translations. All changes you perform are automatically saved. 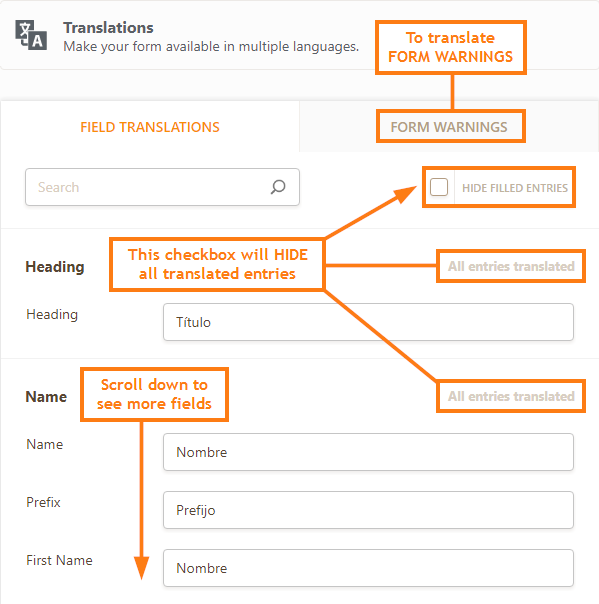 Go to the FORM WARNINGS tab to localize the form warnings if needed. And to avoid confusion, you can also HIDE FILLED ENTRIES so you can focus your work on untranslated fields only. 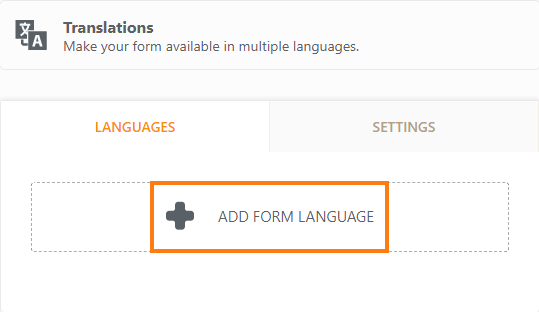 I tried to add a new language to my form but i cant see the drop down menu in the form when i share it online. could you please advice how can i fix it. Hi there, I translated the form, but I also need the PDF form to be translated in the second language. How is this doable? Also, emails are all sent in the original language. Is there a way to translate emails too in the second language? Is it possible to translate the widget Birth date from french to english ? So I have translated my form to English (UK), and the language button works well. But where can I find a documentation of the URL parameter for every language? E.g. what parameter has English(UK)? I tried en, uk, gb.... nothing works with my form. How can I translate a Widget text? Will the form be capable to detect the browsers default language? Will the form automatically display the content in that respctive language? Or will I (alternatively) be allowed to add a paramenter to the form-URL to call the form with a specific language preselected? What is supposed to happen if I assign, say, French or Spanish as the default language? Do the system messages revert to the selected default language? Do the widgets, like date picker revert to the selected default language? So far, in my experience, not. So I can't understand the point of offering a default language selection. I wish you would offer the option of "localizing" all messages and labels for desired languages. I mean, offer this outside of "translating" for multiple languages. It seems what you offer revolves around the assumption that localization means multi-lingual. When often, it just means uni-lingual, but not English. Is there a browser language detect? So that the form can directly open in the language of the user? 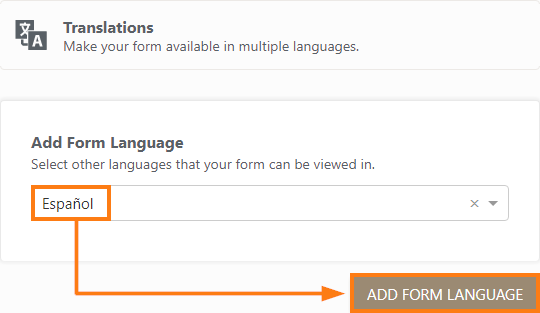 I have been able to create my form in 4 languages, but I have not found a way to make a link that will open the form directly in another language the the default one. I have a slightly different issue in that I am able to add a translation of my form (main language Norwegian) into English, but not all of the editted text is shown when clicking on the English language option when viewing the form. On another document, the same issue but even within the answers, some remain in the original language whilst others are translated to English (despite all being translated in the settings). Hi, I am able to translate the form just fine. However, after the form is submitted in the 2nd language, I cannot save the pdf of the submission in the 2nd language. Hi, I'm going through all your steps to add a French version form but it does not seem to be working. After saving all my changes, there is no option for me to view the FR version. How can I change the language of the components in a configurable list? I would like to change the labels and also the items showed in the combobox. How can I export the language file to send to my translators so that it can be uploaded back to jotform when translated? It won't change the language in the 'Form tabs widget'? Any solution for this? Thanks! Is there an option to create / export a language file allowing me to send all the form text to others to do the translation work? Otherwise I need to either have them edit the form, or I need to write down all form text in a separate document. I have a rather urgent inquiry. I'm trying to translate a form into Japanese and Korean, but none of the fields gets translated, not event the standard jotform fields. Should we translate them ourselvers? I tried to translate form into Georgian. That's ok! the titels of the fields are being translated, but when the language is chosen from English into Georgian by pressing flag button, then the fields' alphabet does not automaticaly changed in to Georgian. It still continues to use English Alphabet to fill the form. Please, could you advise how to enable system to detect and use Georgian alphabet to fill the fields? I have chosen in options: Automaticaly Detect and Adjust the language but still not success. Does it have arabic language support ? I have my form in French and all the emails and pdf are in French too of course. I can't make the source code work for me with Godaddy's website Builder. The language button doesn't work. I tried the iframe and that gives me nothing at all. Hi, the translation selectbox does not work properly on lightbox. I embedded the codes that have been provided but my site displays "Failed to load resource" error. FYI, the translation is working properly upon previewing on your site, also on popup and direct link. 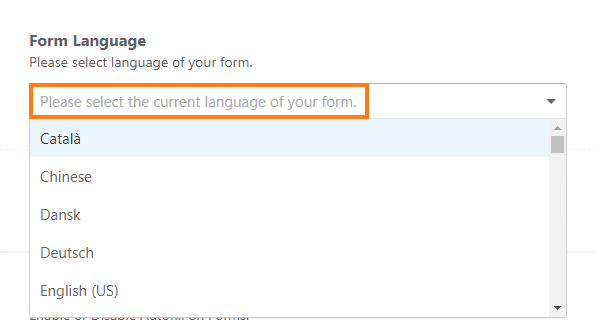 The language button on top of my form does not work (when I click on it, nothing happens), has anyone already met this problem? How could I fix it? Thank you!